Your support group in a book, filled with boundless strength and profound hope - until the fight is won. Along with the shock, fear and loss many women face upon a breast cancer diagnosis comes unexpected strength, wisdom, and strong networks of sharing, support and healing. In Chicken Soup for the Breast Cancer Survivor's Soul, survivors and their family members talk openly about how difficult their fight with breast cancer has been and how they made it through the dark times with a belief in a higher power and the support of those closest to them. Find strength in the encouraging stories of how family members confront their fears and show genuine affection for one another through gestures such as a granddaughter cutting the hair off of all her dolls so that they will look more like her grandma, who is bald from chemotherapy, and the gentle touch of a three-year-old son on his mother's back giving comfort to his sick mommy, and a husband who shows his wife the depth of his love during a weekend getaway after she heals from a total mastectomy. 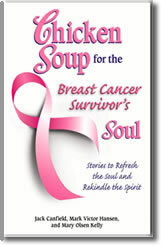 Chicken Soup for the Breast Cancer Survivors Soul will show you the beautiful side of the human spirit and spark the optimism sometimes lost in the mist of an illness. It is for everyone with breast cancer and everyone who knows someone with breast cancer. "This addition to the popular Chicken Soup series should help anyone diagnosed with or undergoing treatment for breast cancer, as well as their close friends and family members. Divided into categories such as love, healing, challenge and courage, the wide-ranging first-person accounts set a positive but realistic tone. Donna St. Jean Conti describes how a saleswoman, seeing Conti’s scar from a mastectomy, whispered that she had found a lump in her breast and asked her for advice on what to do. Beverly Vote writes about the difficult problem of holding on to her sense of herself as a woman after undergoing a mastectomy and of how her husband’s devotion helped her. In the face of her beloved sister Meemee’s diagnosis, Barbara Curtis dealt with her fears by cooking and freez- ing healing foods for Meemee during her treatment (Curtis shares a recipe for Chemo Popsicles to fight nausea). Jennie Nash details how difficult it was to handle the worry about who would raise her children if she died. The editors touch all bases by including a useful account of a male breast cancer survivor."